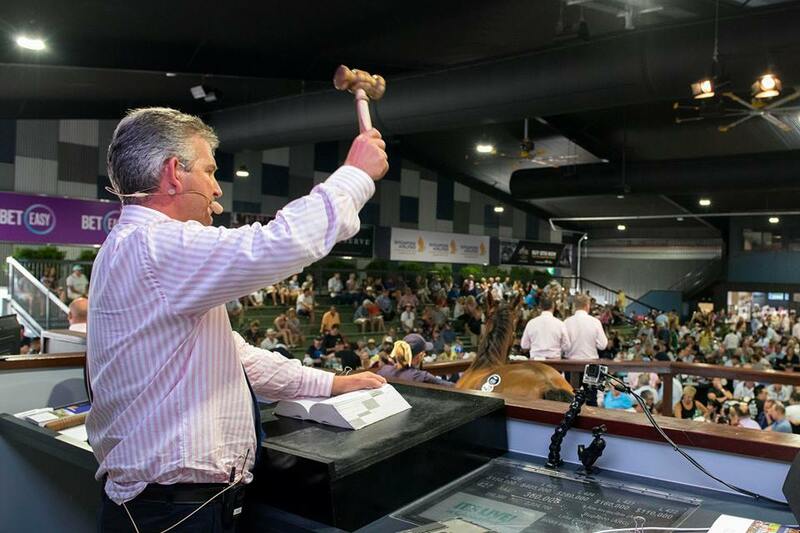 Two leading Australian bloodstock agents have backed the strong market at the Gold Coast Magic Millions believing it will flow on to the rest of the sales season. Federation of Bloodstock Agents Australia (FBAA) members Sheamus Mills and Julian Blaxland bought 23 horses between them in Book 1. Mills paid an average of $221,429 for his seven and Blaxland's Blue Sky Bloodstock parting with a total of $2.75 million for his 16 yearlings. The record Book 1 results, which saw aggregate sales exceed $170 million, were somewhat of a surprise for Blaxland, who thought broader economic uncertainty may restrict growth this year. "I went into the sale thinking, off the back of the local economy predictions, that the market would stay the same as last year, or even dip a little, but the local buyers were strong and that was supplemented by increased overseas spending," he told TDN journalist Bren O'Brien. "I was surprised that the market wasn't adversely affected by what we are reading in the Financial Review. The lending power of people is significantly lower than what it was at the same time last year." Both men agreed that the strength of the catalogue and the work of the Magic Millions to get the right mix of horses was key to the market bucking any broader economic concerns and engaging with the buying bench. "The market was excellent, it was strong at all price points," Mills said. "The point of difference that sale has is that it tried to cater for every market. They try to put a nice $60,000 horse there, a nice $100,000 horse there, and they do that at the expense of filling it with $500,000 horses." "They probably could just be all focused on the elite if they wanted to. But the point of difference they seem to be trying to make is to be more inclusive and I think they do that well." For Blaxland, whose highest-price purchase for the week when buying primarily with trainers Anthony Freedman and Toby Edmonds was $410,000, that middle market was particularly well received. "I thought it was the best Magic Millions catalogue I've ever seen. Speaking to agents and trainers and owners, I was surprised at the sheer number of nice horses on the ground. It made it very hard to whittle it down to a short list," he said. "What we loved about it from a buying point of view was that we bought some really nice horses from $50,000 right up to $400,000 and over. There was a horse for everyone." A look at the comparative results of 2019 and 2018 catalogues shows the strength of that mid-range market. In 2018, there were 456 yearlings sold between $100,000 and $400,000 for an average of $208,000. This year it was 502 yearlings at $212,000. The top end also had plenty of depth, too. Last year there were 87 yearlings sold for more than $400,000, this year there were 96, while at the very top there were 11 $1 million plus buys compared to nine in 2018. Driving that top end was the proliferation of 'colts funds', the syndicates and larger international buyers who are in competition to buy the next potential stallion. Of the top 15 lots at Magic Millions 2019, 13 of them were colts, compared to last year when it was 10 of the top 15. Mills said the majority of the 'colts funds' were well-backed and had a longer-term strategy, but he does think there are a limited pool of investors that can play in that area. "The stallions syndicates that are trying to do that, and are well set-up and well managed, it makes perfect sense because they can go and buy 20 $500,000-plus colts for the year and you might spend up to $20 million all up, and realistically these days, you need one or two of those to become stallions and it will pay you back," he said. "Part of the game these days is to make sure your neighbour doesn't have the young boom colt and make sure that horse is on your farm and that makes perfect sense to me. "My thoughts where you are operating below that, on a syndicate level, the colt market can be pie in the sky. You go to buy one colt. There are 700 colts in that sale, and the idea that one individual buyer is going to go pluck and get that one stallion that is in that sale is fanciful." "But it’s a game for dreamers this and if people weren't dreamers, we wouldn’t have an industry." Blaxland said that while the colts funds may be dominating the market, that hasn’t necessarily flowed onto the track, which was a good thing for industry. "I think any investment in the market from these big groups is great. It helps the whole thing go around," he said. "The other thing to note is that the last 12 months, how many Group 1 races have been won by those groups? Most of the Group 1 juvenile races have been won by other people. "We had Unite And Conquer (Hinchinbrook) go around in the Magic Millions and he was an $80,000 buy. I'm sure he wasn't on the list of any of the colts groups. That's the beauty of a Magic Millions sale and the race series and it’s the beauty of horse racing. "Despite having high-powered, high-money colts syndicates around, everyone still has a chance, otherwise no-one would do it." The one area which both men agreed the market was a little soft was in the first-season sires market. In 2018, driven by the popularity of Deep Field and Dissident, there were 137 yearlings sold by the top five first-season sires at an average of $181,313. This season, the top five on aggregate sold just 89 between them at an average of $146,000. "The first-season horses were a bit softer than I expected," Mills said. "Magic Millions are known for being huge supporters of first season sires. It seems to me the market was a bit softer on the first-season horses than the past." Blaxland certainly noticed the increased affordability of the freshman group. "Some of the first seasons sires we bought in recent years, they have been very hard to buy, last year, especially," he said. "Last year it was hard to buy a good Deep Field or a good Dissident. I thought they were a lot easier to buy this year. We bought the Vancouvers and Pride of Dubais from $120,000 up to $400,000, and smaller trainers and agents with lower budgets could actually get in this year." The energy from that area spread elsewhere, with Mills saying he felt there was a higher premium out on the penultimate crop of Hinchinbrook as well as Written Tycoon, who had a fantastic sale. Blaxland noted the stock of More Than Ready (USA), who served his final season at Vinery last year, and the likes of Sebring were in demand. "Maybe that's the market going back to the proven horse but I thought some of them sold very well. In previous seasons, you could get them pretty well. Both Blaxland and Mills expect the strength of the market will flow on to the rest of the sales, but now that the standard has been set for 2019, the challenge was out there to the other sales companies to rise to. "It’s very buoyant, but I think the Magic Millions has probably got the two other sales companies on the back foot," Blaxland said. "They always get first crack at money. "They’ve set the bar pretty high and it will be interesting to see whether that carries on to later in the year. The quality of Easter can never be called into question, it’s a very high-quality sale but it will be interesting to see how the size of the Classic Sale flows on to Easter and how that plays out."